Especially well-suited for knights of all kinds, the Battle-Worn Novice II LARP Long Sword is a LARP weapon for beginners and seasoned fighters alike. This latex-free foam sword has been detailed by hand for a weathered, battle-scarred look. Because the process is done by hand, these details are unique to each LARP sword. No two look exactly alike. The long foam blade has a diamond cross-section and a realistic weathered steel color with matching steel tone crossguard and round pommel. Made of incredibly durable and wear-resistant Calimacil foam, this medieval LARP sword is a safe and trusted weapon for all kinds of battle. Inside, a flexible fiberglass core provides safe structure. The grip has a tightly wrapped look for a textured hold. 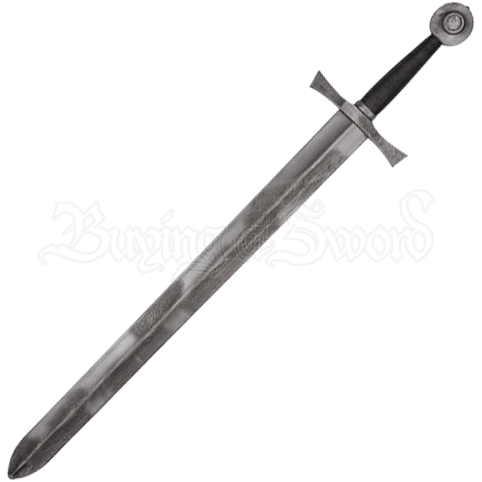 Whether your character is a noble knight, medieval soldier, or a unique warrior of your own design, this realistic LARP sword is great for any medieval or fantasy LARP battlefield.